Supporting the growth of women in science, technology, engineering and math is as mission-critical to her organization as ever, Debbie Hart said. However, it is not always easy. “We’ve been paying more attention to this issue over the last couple of years, and, as we build out our programs, we always want to make sure we (include) women,” Hart, CEO and president of BioNJ, the 400-plus member organization and advocate for the state’s biotechnology industry, said. “I am sorry to say that, sometimes, it is difficult to find women in various roles at certain levels in the industry. Hart spoke recently at BioNJ’s third annual “Inspiring Women in STEM Conference” at the Sanofi U.S. headquarters in Bridgewater. 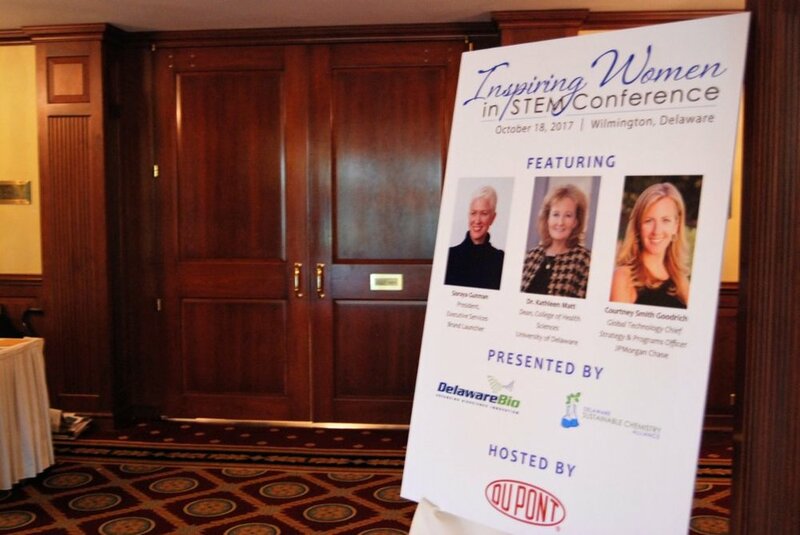 More than 250 attendees from over 75 organizations participated in Delaware’s fourth annual Inspiring Women in STEM Conference at the DuPont Country Club on November 15, 2016. Scientists, engineers, researchers and other professionals in STEM (science, technology, engineering and math) industries united for a day filled with engaging professional development sessions and insightful presentations from a diverse and dynamic group of speakers. The conference also provided an excellent opportunity for attendees to expand their professional networks with fellow women in STEM from a variety of industries and organizations. The 2016 conference featured speakers, panelists and attendees representing the major science and technology-based companies and educational institutions in Delaware, including DuPont, Siemens, Agilent Technologies, W.L. Gore & Associates, University of Delaware, Bloom Energy, AstraZeneca, and Christiana Care Health System. Tanya Bakalov, Founder & CEO of BetterSkills and Co-Founder of SevOne, shared her inspirational journey in the Keynote Address “Women in Technology: Starting at Ground Zero and Breaking Through the Glass Ceiling”. The signature session of the conference, “A Conversation with STEM Leaders” featured Susan Brennan, Executive Vice President and Chief Operations Officer of Bloom Energy, and Dr. Janice Nevin, President and CEO of Christiana Care Health System. Their lively and candid discussion was expertly moderated by Dr. Alexa Dembek, Director of Science and Innovation at DuPont. The 2016 Inspiring Women in STEM Conference also provided an opportunity for attendees to foster connections with six local non-profit organizations that offer STEM education programs for girls. The involvement of adult mentors and volunteers in their programs is essential to inspire and empower the next generation of women in STEM. Agilent Technologies generously provided cash awards to further support the efforts of Girls Scouts of the Chesapeake Bay, FAME, Inc., First State Robotics, Girls Inc. of Delaware, Hagley Museum & Library, and the Delaware Nature Society. The 2016 Inspiring Women in STEM Conference was made possible by the generous support of the following sponsors: DuPont, Incyte, Agilent Technologies, JP Morgan Chase, Solenis, University of Delaware, Delaware City Refining, Christiana Care Health System, Capital One, Delaware INBRE, Ernst & Young, Air Liquide, BASF, Fish & Richardson, University of Delaware College of Engineering, W.L. Gore & Associates, AstraZeneca, McCarter & English, and PNC Bank. The Delaware BioScience Association and the Delaware Sustainable Chemistry Alliance (DESCA) organized the inaugural Inspiring Women in STEM Conference in 2013 to encourage and support women involved in all aspects of science and technology in their professional lives, including industrial and government scientists and engineers, academic researchers, STEM educators, graduate students, and entrepreneurs. Enthusiastic response convinced the organizers to offer the conference annually and add single-topic forums throughout the year. Inspiring Women in STEM conferences and forums are developed by co-chairs Jennifer Kmiec, Lori Palmer and Helen Stimson, with the support of a dedicated planning committee of volunteers from industry and academia. Created in response to the success of BioNJ's first Inspiring Women in STEM Conference, this Inspiring Women in STEM Symposium in June 2016 featured a morning of inspiration, learning and professional development. Held at the Institute for Life Science Entrepreneurship at Kean University, STEM professionals of all levels participated in an interactive discussion on "Becoming Your Own Best Advocate". BioNJ's inaugural Inspiring Women in STEM Conference was an action-packed, full-day schedule of forward-thinking, professional development sessions that engaged and inspired participants at all stages of their careers. From practical advice on effective ways to navigate your career to the opportunity to learn from the experiences of successful women who have traveled remarkable journeys, attendees came away with valuable and actionable ideas and guidance. The Conference’s signature session featured A Conversation With STEM Leaders sharing personal examples of inspiration, determination and grace. Our impressive panel included Donna Tempel, Ph.D., President and CEO, Drais Pharmaceuticals, Inc., and Vice Chairman of the Board of Trustees, BioNJ, Avis Yates Rivers, President and CEO, Technology Concepts Group International, and Hilary Malone, Head of Global Regulatory Affairs for Sanofi US. View the 2015 BioNJ Inspiring Women in STEM Conference photo gallery here. Delaware's 3rd annual Inspiring Women in STEM Conference featured skill-building sessions focused on communications, understanding generational differences, developing powerful workplace teams, and realizing your full potential. There was also ample time for high quality networking. An Exhibitor Showcase highlighted local organizations where women explored opportunities to inspire girls to enter STEM fields. The inaugural Inspiring Women in Science & Technology conference was presented by the Delaware BioScience Association, the Delaware Sustainable Chemistry Alliance, and the Technology Forum of Delaware. The full day program of accomplished speakers, educational workshops and stimulating panel discussions helped women advance in their Science, Technology, Engineering and Mathematics (STEM) careers. Ellen Kullman, CEO of DuPont and Terri Kelly, CEO of Gore, shared the stage to share their wisdom and professional journeys. Attendees also had the opportunity to explore ways in which they could give back to their community by inspiring and mentoring the next generation of women scientists.